You’re just about to take your first bite of pizza when, suddenly, all of the cheese slithers off faster than a 5-year-old going down a slip-n-slide. Or how about when a slice is so greasy that you have to use dozens of napkins to soak everything up? Or when a pizza’s cheese-to-tomato sauce ratio has clearly missed the mark? Or when you order a slice of pepperoni and only get a couple pieces of pepperoni? Or when the pizza doesn’t taste very fresh? Or, even worse, when the pizza just doesn’t have any taste at all? Luckily, the pizza places within close proximity to Grounds at the University of Virginia don’t suffer from any of these fatal flaws. I know this because I’ve spent my summer trying them. 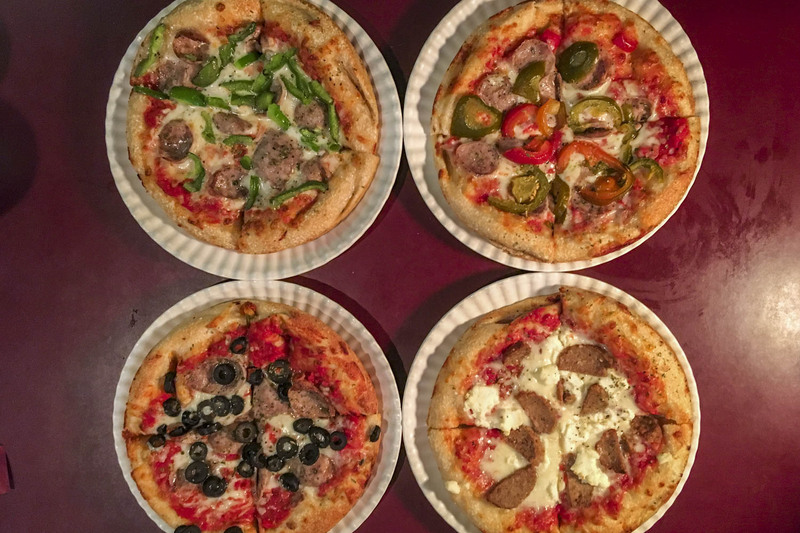 Yes, in a public service to help new UVA students assimilate (we certainly don’t want you falling in with the wrong crowd and eating frozen pizza), I visited eight go-to pizza places that were handpicked by our crack UVA Today staff. To paraphrase a movie character played by actor Stephen Baldwin many years ago: Even when pizza’s bad, it’s really pretty good. But trust me, none of these places fall into that category. All of the establishments I sampled are awesome in their own ways. That said, everyone has their own idea of what constitutes good pizza. As a New York City native who grew up eating a lot of Ray Bari (a popular chain in New York), I am partial to thin crusts. It’s an appreciation that grew to new levels when I lived in California and experienced Via Vai Trattoria Pizzeria (located in Santa Barbara). Really, I pooh-poohed any kind of deep dish or thick-crust pizza for many years. To me, it just seemed too heavy. But then I visited Chicago for the first time a few years ago when the UVA men’s basketball team played in the NCAA Tournament. It turned out that I had been completely unaware of how a typical Chicago pie was constructed: sauce on the top and cheese on the inside. Doughy, cheesy, slightly crispy – it had it all. I ate deep dish the next three nights. While the experience didn’t completely convert me (I still prefer thin crust), it gave me a new appreciation for how the other side lives. But enough with my pizza pilgrimage. Let’s get you started on yours. Don’t judge a book by its cover, or, in this case, a pizzeria by its confusing entranceway, outdated décor and dim lighting (which, truth be told, is actually part of the charm). Of all the places on our list, Anna’s reminds me the most of the pies I grew up eating in New York: Thin and foldable, a perfect cheese-to-sauce ratio, not too greasy, chewy but crunchy and just a hint of garlic and oregano that gives the pizza a truly unique taste. Anna’s, which is run by sisters Maria and Marta Buzzetta, is one of the longest-running pizzerias in Charlottesville. In the early 1970s, the Buzzettas’ parents, Giovanni and Nunzia – known as “Papa and Mama” – moved from Sicily to Brooklyn before coming south to Charlottesville in 1976 and opening Anna’s, which they named after Maria and Marta’s grandmother. Anna’s gets its mozzarella shipped from Buffalo, New York, which is perhaps a reason why it reminds me so much of the Big Apple’s pizza. Maria says the ornate black-and-gold wallpaper inside the restaurant has been there since they moved in 42 years ago. Luckily, the recipes haven’t changed during that time, either. 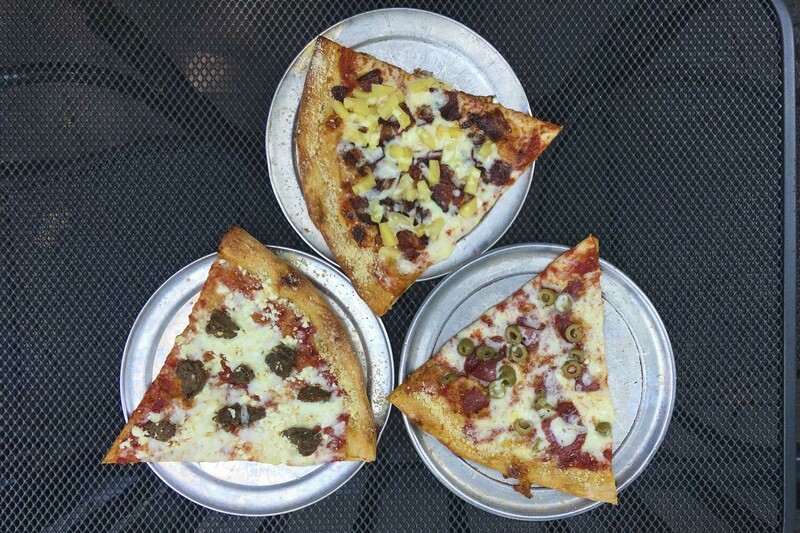 Hours: Monday through Thursday, 11 a.m. to 10 p.m.; Friday and Saturday, 11 a.m. to 11 p.m.; Sunday, noon to 10 p.m.
With an absolutely perfect cheese-to-sauce ratio, these “Virginia Slices” are similar to Anna’s. Where they differed from Anna’s – and from every place on our list – was in size and crispiness. The 28-inch pies here are roughly two times larger than typical pies – which means giant 14-inch slices! The chain awards $500 to any “amateur” eater who can finish one of its eight-pound pepperoni-and-sausage pies in under an hour. You also get a T-shirt, a spot in the Hall of Fame and, as I can personally attest to, some serious heartburn. 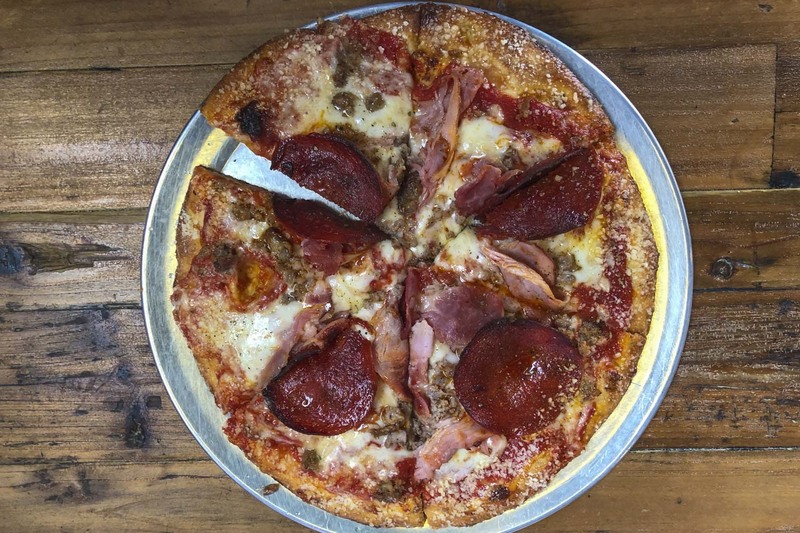 Benny’s was started by a fella from Brooklyn named Benedito, who, according to the chain’s website, worked in a Manhattan kitchen at an exclusive Italian social club as a youngster before moving to Virginia’s Eastern Shore, where he began making pizza in a brick oven for neighbors. The perfect amount of crispiness – a result of being cooked in a wood-fired oven – is what really makes the pizza special. They get a great char on the crust’s edges. One of the most popular pies is garlic mushroom. 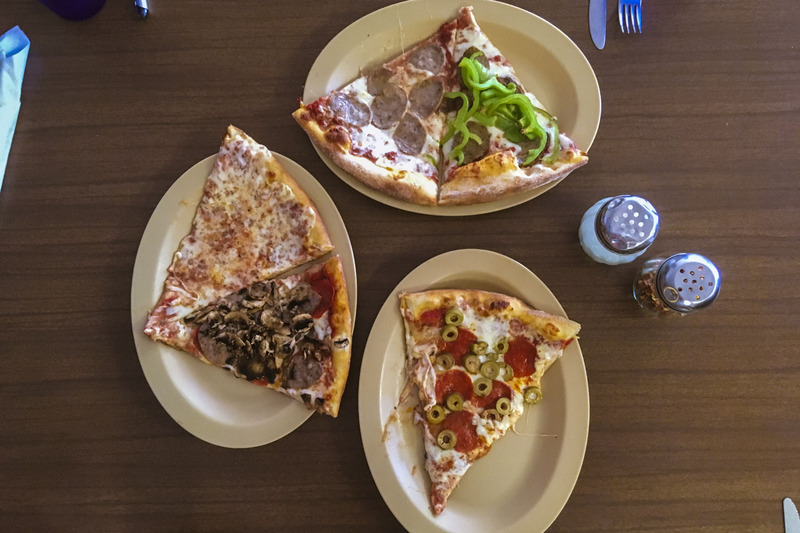 The beauty of Benny’s is that just one slice should leave the average eater plenty full. Location: 913 W. Main St. Hours: Sunday-Wednesday, 11 a.m.-12 a.m.; Thursday, 11 a.m.-2 a.m.; Friday and Saturday, 11 a.m.- 3 a.m. When I first moved to Charlottesville in 2005, this was one of the very first places I ate. I went to the location on the Downtown Mall and was immediately drawn in by the fact that one, you can get pizza by the slice; two, you can see all the slices behind a glass partition and pick out the exact slice you want; and three, with a vast array of unique toppings – such as artichokes, avocados, spinach and sundried tomatoes – you actually feel like you’re eating healthy. What I love most about Christian’s is the freshness of the toppings and the fact that you never have to wait very long to eat. 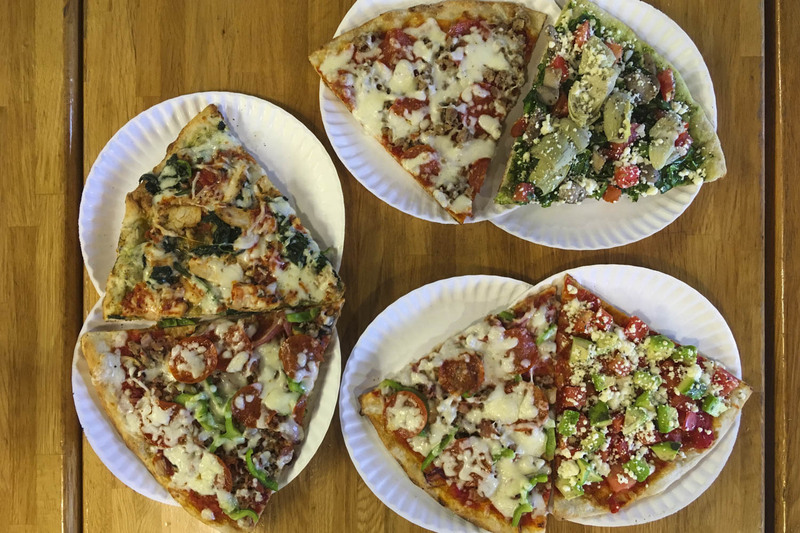 You select your slice, they throw it in the oven and buon appetito! No messing around. The atmosphere is also great. You can sit at tables and look out at passersby through the large glass windows. 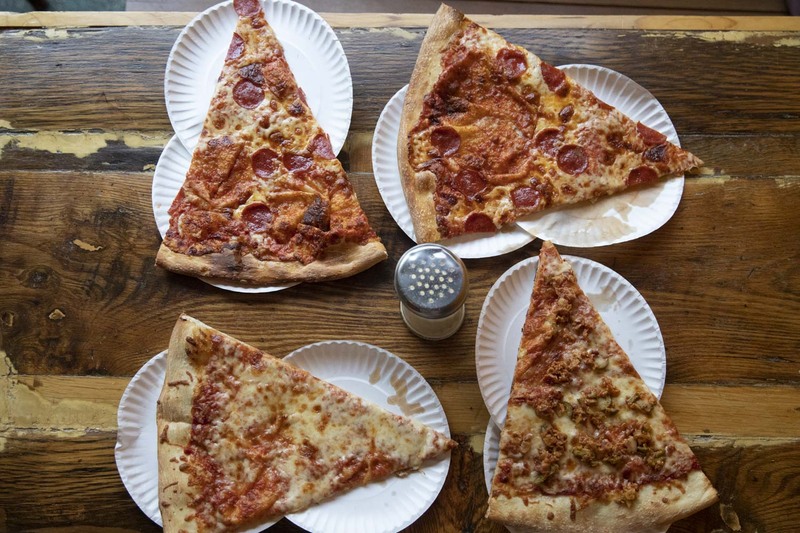 Christian’s is a great place to meet up with friends for a late-night slice. My go-to slice is one topped with big chunks of fresh mozzarella and tomatoes. It makes me feel like I’m ordering a caprese appetizer at an upscale Italian restaurant. The only difference here is that it is served on top of a delicious crust! Another one of my favorites is with spinach and feta cheese – but you really can’t go wrong with anything you order at Christian’s. You can’t beat the history of the College Inn. This place, located in the heart of the Corner, has been here since the beginning of time (or, to be more precise, 1953). The slogan, “Meet You at the College Inn,” rings as true today as it did 65 years ago. The inn’s décor is soaked in nostalgia, with photos of famous alums and sports stars adorning the walls. If you can’t find something to eat here, then you, my friend, are a picky eater. One of the restaurant’s staples is pizza. If you’re a crust lover, this is your spot. The pies have a very doughy crust. The tomato sauce here is of the sweeter variety. What I like most about the pies are that they don’t skimp on toppings and aren’t too greasy. Also, the personal pizzas available for lunch are just the right size and won’t send you into an afternoon food coma. Hours: Monday through Saturday, 9 a .m. to 2 a.m.; Sunday, 9 a.m. to 1 a.m. In 2012, a new location – which had previously been home to the popular Buddhist Biker Bar – opened on the Corner. Last summer, Brunk purchased the franchise. 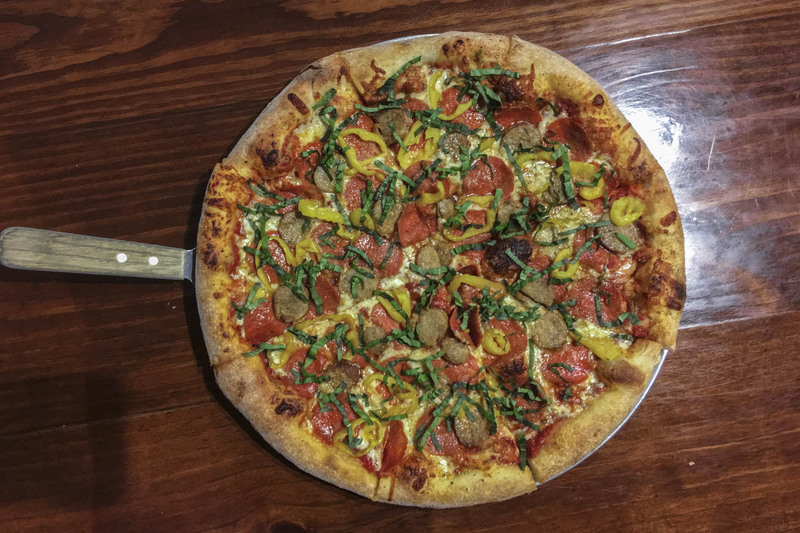 I decided to split a “Feisty Italian” – a pie topped with pepperoni, Italian sausage, banana peppers and basil – with two coworkers. The ingredients blended together perfectly. I’m not usually a big banana peppers fan, but they added a nice crunch. With live music Thursday through Saturday night on the restaurant’s patio, you can’t beat the setting here. And, yes, if you’re wondering, Brunk – who used to be part of a popular metal group named Corsair – still likes to rock out. He plays bass with singer/songwriter Rob Cheatham and in the occasional Tom Petty tribute band. Hours: Sunday and Monday, 11 a.m. to 9 p.m.; Tuesday through Saturday, 11 a.m. to 2 a.m. Available by the slice: Yes. Between 11 a.m. and 2 p.m. on weekdays and after 10 p.m. on Saturdays. For many years, when members of the UVA community needed to gas their car or have its oil changed, they went to Fry’s Spring Service Station on Jefferson Park Avenue. Fry’s also sold penny candy and was considered a gathering place. Today, Fry’s is a super-cool-looking pizza joint. In 2009, new owners did a great job restoring and preserving many of the service station’s features – most notably the old garage doors. When the weather is nice, they open out to a patio. The thin-crust, wood-fired pies here remind me in texture and size of California Pizza Kitchen ones. On the day I dined there, I thoroughly enjoyed the Margherita (mozzarella, crushed tomato, basil, olive oil). My dining companion had the “Piggie Smalls,” which comes with sausage, smoked ham, spicy capicola and pepperoni. Other specialty pies: The “Flying Finocchio,” which features sausage, fennel, lemon, ricotta and red sauce; “North of the Border,” which has black pepper honey bacon, red onion, jalapeno, cheddar, tomato avocado salad and white sauce; and “The Dude Abides,” which is topped with a soft poached egg, white sauce, cheddar, smoked ham, tomato and scallion! If you ever order meatballs on a pie here, be prepared. They’re roughly the size of golf balls. Location: 2115 Jefferson Park Ave. Hours: Monday and Tuesday, 11:30 a.m. to 9 p.m.; Wednesday through Saturday, 11:30 a.m. to 10 p.m.; Sunday, 10 a.m. to 9 p.m. Surprised to see this name on our list? Don’t be. 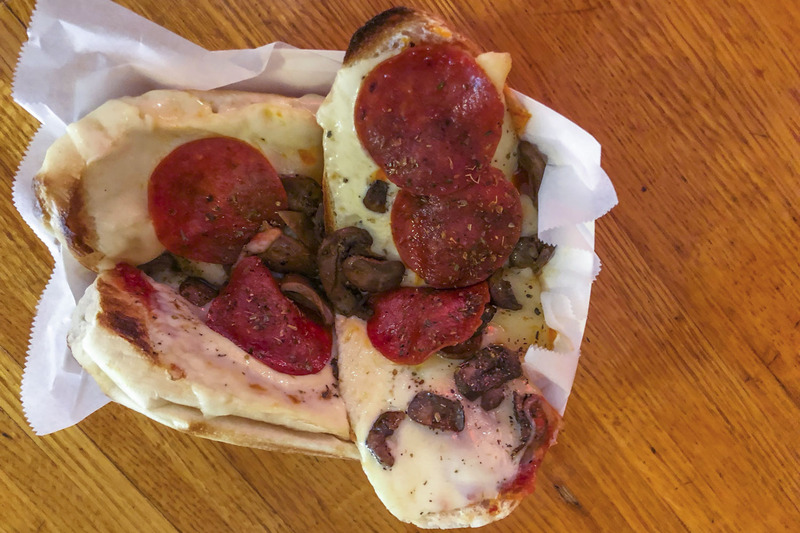 While the New York-style deli that was started by UVA alum John Crafaik on The Corner in 1976 is best known for its subs – including ones named after former UVA star athletes Ralph Sampson and Chris Long – it also makes a truly delicious French bread pizza. The pizza is a sub roll that has been sliced in half, doused in marinara and topped with large slices of melted mozzarella. Served open face, you can add whatever toppings you desire. When I visited, I went with pepperoni and mushrooms. I was shocked by how much I enjoyed the very simple concoction, which put Stouffers French bread pizzas (which I’ve always liked) to shame. Littlejohn’s also serves flatbread pizzas (off the menu). Since taking over the restaurant in May, Trendel says he has reinstituted the late-night hours that students love. I’m betting they’ll love the French bread pizza, too. Hours: Sunday through Tuesday, 8 a.m. to 10 p.m.; Wednesday through Saturday, 8 a.m. to 3 a.m. Available by the slice: N/A. Mellow Mushroom was started by two Georgia Tech students in Atlanta in 1974. Today there are more than 150 locations throughout the United States. The pizza at this Charlottesville franchise doesn’t taste anything like you’d expect from a chain of that size, though. Mellow has a great selection of fresh toppings, including pineapple, spinach and artichokes, and some of the most unique specialty pies of any places on our list. There is the “Great White,” which has an olive oil-and-garlic base with sun-dried tomatoes, provolone, feta cheese, seasoned ricotta, basil, mozzarella, roma tomatoes and onions; the “Veg Out,” which has mellow red sauce with mozzarella, spinach, green peppers, mushrooms, onions, black olives and tomatoes; and the “House Special,” which has their own “mellow” red sauce with mozzarella, pepperoni, sausage, ground beef, ham and applewood smoked bacon. I kept things nice and simple when I went. I ordered the lunch special, which was a 10-inch, personal-sized sausage-and-pepperoni pie that came with a side salad. The stone-cooked pie had the thickest and crispiest crust of all the places on our list. Location: 1321 W. Main St. Available by the slice: Yes. Weekdays between 11 a.m. and 2 p.m.